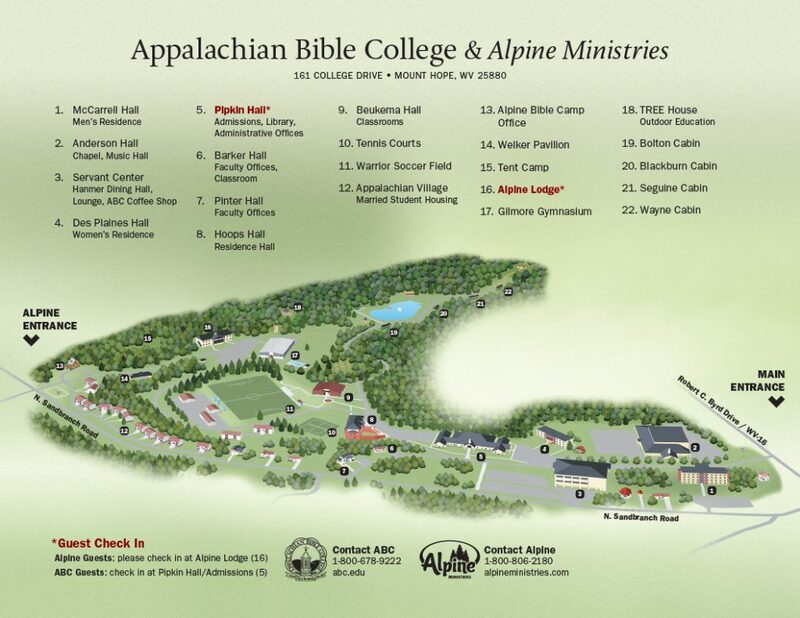 Alpine Ministries shares the the beautiful campus of Appalachian Bible College. Items on the map correspond with the numbers below to help you take a virtual walk through our facilities. In the summer time, Appalachian Bible College’s dorms become housing for the many guests enjoying adventure and retreats on campus. Appalachian Bible College’s Hanmer Dining Room is the primary dining facility for adventure and retreat guests. Entrées, hot sides, fountain drinks, multiple coffee options, a salad bar, and dessert bar all serve to provide delicious meals to our guests. Cool down with an iced drink or warm up with a hot cup! The ABC Coffee Shop serves up a variety of delicious Crimson Cup coffees and teas in a relaxing atmosphere. Help yourself to the board games and take a look at the shirts and other items for sale. Our heated saltwater pool offers refreshment for campers and guests. Conquer challenges with your team! Alpine’s multi-level high ropes course focuses on challenge-by-choice and teamwork; each element is meant to be accomplished with the help of a partner. Climb high on our outdoor climbing tower, take a ride on the Adventure swing, or play ga-ga ball, 9-square, and sand volleyball with your friends! Alpine’s Adventure Zone offers a wide variety of outdoor fun for all ages. The Alpine pond offers fun to everyone, boasting a blob, water slide, inflatable islands, water mats, and a zip line that ends with a splash landing into the water. Gather a team and grab a bar! See how many goals you can score against the opposing team. Fly over—or into!—the Alpine pond on zip lines. New in 2017! Relax with your friends as you enjoy a view of the pond and the zip line directly overhead. Alpine’s beautiful Welker Pavilion allows guest groups and campers the opportunity to enjoy an outdoor cookout. Offering both shade and shelter, the pavilion can host meals rain or shine. For more adventurous guests, Alpine offers tent camp. Platform tents provide the right amount of comfort without sacrificing the camping experience. The spacious Alpine Lodge is the hub of summer activity at Alpine. Whether checking in for overnight camp, adventure trips, or retreats, the Lodge is your first stop as you arrive. The Lodge is beautifully structured with a cathedral glassed lobby, twenty motel-style rooms, conference rooms, a gift shop, and a large stone fireplace. Across the parking lot from the Lodge, Gilmore Gym is the check-in spot for Day Camp in addition to housing a collegiate basketball court, climbing wall, and dining facility for Alpine Bible Camp. At the T.R.E.E. house, campers and field trip groups find Truth Revealed through Environmental Education (T.R.E.E.). In a society full of questions, the truth can be hard to find. At Alpine, our desire is to enable every student to discover the truth about the created world through first-hand observation. Each cabin has two separate units with bunk beds, restroom facilities, and electric heat.